Posted January 17, 2018 by Georgia Clark & filed under Inner West Independent. One of the inner west’s longest running community gardens is this year heralding 20-years at the forefront of the community garden movement. The Whites Creek Community Garden forged its place as one of the inner west’s most successful community gardens after a hard-fought battle to reclaim the area as public space began in the 1980’s. 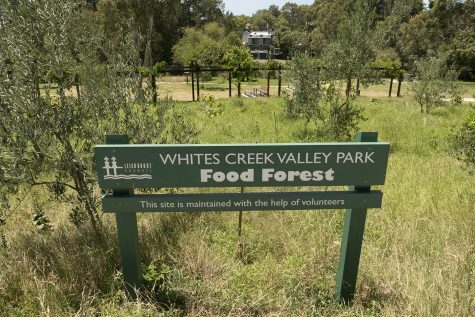 The volunteer-run founders of the garden, Friends of White Creek, are bringing the inner west community together in the name of sustainability with weekly volunteer and various workshops including one at the Footprints Ecofestival this month. From composting workshops to permaculture in the Food Forest, the community hub helps people learn about urban agriculture and sustainable food production. The founding plotholder of the Whites Creek Community Garden, Gillian Leahy, says that consumer interest in the food production process has spurred on the grassroots garden movement. “More people are becoming aware of the need for sustainable practices when growing fruit and vegetables, both so we grow food uncontaminated by pesticides and the like, and so we renew the soil and don’t destroy the soil’s capacity to keep on producing,” she said. The Whites Creek Community Garden is just one of 600 community gardens popping up around Australia as consumer demand for sustainable and organic produce rises. Consumer interest in the provenance of consumer products is evident in the rising popularity of farmers’ markets in Australia, with 40 markets recognised by the Australian Farmers Association alone. According to Ms Leahy, community gardens are a place for people to reconnect to both their communities and agricultural techniques. The community garden is open to visitors during the day and holds working bees every 3rd Sunday of the month to teach volunteers about permaculture and growing fruit and nuts. According to Russ Grayson, representative at the Australian City Farms and Community Gardens Network, community gardens enable urban residents to grow the very food they’re eating whilst bonding with other members of the community. “It is a new way for citizens to interact with public land, and progressive local governments are helping them do this by adopting enabling policy for community gardening,” he said. Maire Sheehan, former Mayor of the Leichhardt Council and local resident, says that community gardens offer an opportunity for the community to reclaim public space and increase awareness about the food production process. According to Ms Sheehan, the density of urban spaces around the inner west has contributed greatly to the proliferation of the community garden movement. In the founding days of community gardens, rallying for public spaces to be converted into garden space wasn’t an easy feat. After a spate of petitions to council, Leichhardt Council adopted the plans for a community garden and food forest.